Horror is about transgression. The blurring of boundaries. Or maybe its just about a three-hundred year old monster sucking people's brains out through the back of their necks with his razor sharp forked tongue. I first saw clips of this little Mexican dandy on USA Network's divine Reel Wild Cinema, a show I sorely miss. I still have my fan club card. Sandra Bernhard hosted clips of Z-grade treats wearing tight leopard print numbers or lime-green pleather. Suffice to say every element of that show made a big impression on my teen-age psyche. 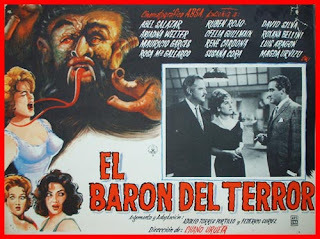 El Baron del Terror (or the American release title of The Brainiac, cause, ya know, he eats brains) was one of the stranger flavors introduced. Note: I tried to set this up as a download so you could have the whole film for your own. Couldn't get it to work, though. You can watch the movie on youtube at least. now go get that tongue action!